When Jeff Bezos purchased The Washington Post on Monday, August 5, I was immediately disappointed it wasn’t Amazon that made the acquisition. If it were Amazon, the company would be more likely to monetize the asset faster, and perhaps quickly purchase and revolutionize other news outlets. Since Bezos bought the company personally, he has the luxury of time to reform it. I’m less interested in how Amazon will rescue the Post than on how the Post can invigorate Amazon. Assuming there would be an agreement between The Washington Post and Amazon.com, Amazon’s websites could get something they lack now and desperately need: news. Amazon product pages currently show you such things as products other customers have bought in the same category, customer reviews and ratings, products related to the product you’re viewing, and even ads related to a product, but the page doesn’t contain news headlines related to the product. If users of Amazon.com were offered a variety of relevant news headlines on product pages, it would significantly increase interaction with the site, time spent on the page, time spent on the site, and cross-promotion of Amazon products and services. Adding news headlines would increase the advertising value of Amazon’s properties and provide one more compelling reason — along with their Amazon Cloud Player — to keep Amazon open all the time, on the computer, the tablet or the smartphone, at work, at home, or in the car. News coverage allows for the natural cross-promotion of products and services. When you cover a trial, for example, you inadvertently (or advertently?) scoop up information about what people were wearing, what tools they were using, and how they looked. News = brands in action. The fact that products and services mentioned or shown in newscasts on Amazon will be available for purchase through Amazon has the potential to make e-commerce so much more compelling! Amazon is a formidable retailer. Amazon infused with credible news is an unbeatable media property. The fact is, more businesses should infuse their websites with news. When it comes time to buy a product or service, people naturally turn to sites they already know and trust. So how do you get known by a potential customer before they are ready to make a purchase? You have two main paths: advertising and news. With advertising, you pay to have your message inserted where potential customers can be found. With news, traffic moves the other way: people come to you to learn more, rather than you chasing them. You can call it PR or inbound marketing or content marketing or social marketing, but the fundamental result is the same: people visiting your site or your assets long before they feel a need for your products or services. When you offer real news — that is, expert explanations of breaking information in your field — you tap into current affairs and discussions in a way that is valuable to your audience and your brand. The customer who is not yet a customer is not interested in your product descriptions or capabilities posts or internal company dialogue or news about your organization. They are drawn close by coverage of breaking news in their field. When the day arrives when they need your services or products, they will already be familiar with your brand. Sites that cover the news on a daily basis will see a steady increase in monthly traffic. The content that accumulates from years of covering the news matches with an incredible number of long-tail search strings to insure increasing traffic every month. 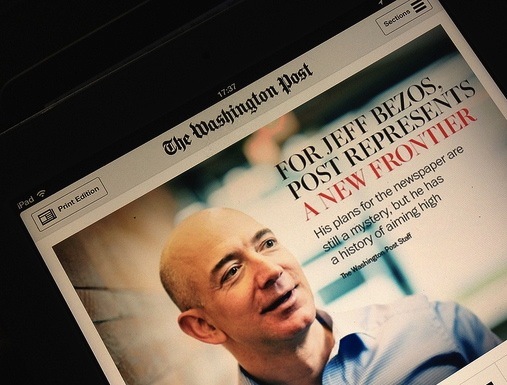 When you cover the news for enough years, as Jeff Bezos knows, it hardens into a brand such as The Washington Post. Bezos is hopefully about to begin mining that mountain of exclusive, original content the Post has built up for over 80 years. How many book reviews has the Post done? Those could be used in full on Amazon’s site, not just blurbed. How many recipes has the Post published that could be tied to ingredients for sale on Amazon? How many photos of people does the Post‘s photo library contain that could be analyzed for the clothes worn and shown next to similar clothing for sale on Amazon.com? Unfortunately, these news assets don’t belong to Amazon and can’t be deployed until The Washington Post cuts a deal with Amazon. I hope that happens right away. Ask not what Amazon can do for newspapers; ask what news can do for Amazon — and for you!